A room full of kids. Quiet. The only sound an occasional question. They’re all deeply concentrated on one task. These kids are participating in the first ever Robot Camp organised by Science Centre Delft. At the end of the three-day long camp, they will have built their own Zebro, a six-legged autonomous robot inspired by insects. 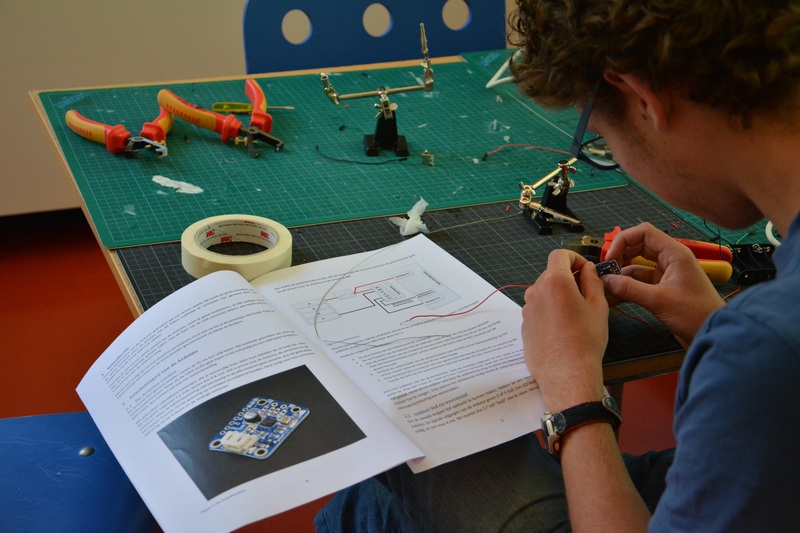 The Robot Camp is an initiative by Science Centre Delft, in cooperation with Delft University of Technology Robotics Institute. The camp is meant for high-school students of VWO-level between the age of 14 and 16. During the camp they will build and program own robot. At the end of the three-day camp, their robots will compete against each other. The robot is, of course, theirs to keep afterwards. After receiving initial instructions and some background information about the robot, the kids were left with an instruction manual and the parts to build their very own robot. Helpful personal from Science Centre and Delft University of Technology are there to answer questions and assist where needed. Professor Chris Verhoeven was amongst them to help out as well. The Robot Camp is an important event for Chris Verhoeven. According to Verhoeven you can’t become an engineer, you’re born as one. “The Robot Camp is meant to help you realise that you are an engineer.” It’s extremely important that kids of this age, that have been thought to think on an academic level realise that. This will help them to make the right decisions for their future education. While we were there, Chris Verhoeven showed us the various Zebro models that are currently being built by the Robotics Institute. There was the familiar smaller Zebro that we have seen before. We also got to see a very large Zebro, strong enough to carry a person once it’s finished. One of the other Zebros was programmed to be controlled with a tablet. With the press of a button you can guide the robot in the right direction and turn its sensors on or off. This is the Zebro that’s also being built by the kids at the camp. Pretty soon, there will be a lot more Zebros walking around. Not just because of the summer camp, but because the university is ramping up production. The Zebro has a lot of capabilities. Due to the various sizes they come in, Zebros can be deployed in a wide array of environments and situations. From exploring the surface of the Moon or Mars to walking around buildings. For now, the participants of the Robot Camp are still building their Zebro. Soon they will compete to see who has built the best one. Keep an eye out because these kids are the engineers of the future. Soon they will be building robots of their own design. Some of these robots might even make their way into our daily lives.